Many hours after leaving the Marian Goodman Gallery this week, the sound of William Kentridge’s More Sweetly Play the Dance continued to fill my head. Kentridge is a visual artist, but in this piece — a film combining animation and live action projected across eight continuous large screens in the gallery’s first-floor space — music plays a particularly important role. The work depicts a long procession, its composition reflecting the artist’s South African upbringing (his father was a lawyer who defended Nelson Mandela and represented Steve Biko’s family) and the time he has spent in Paris and Beijing. Skeletons, ballet dancers, invalids, priests, bandsmen, bearers of votive objects and other human flotsam and jetsam move through a blasted landscape scratched and washed in Kentridge’s Indian ink. 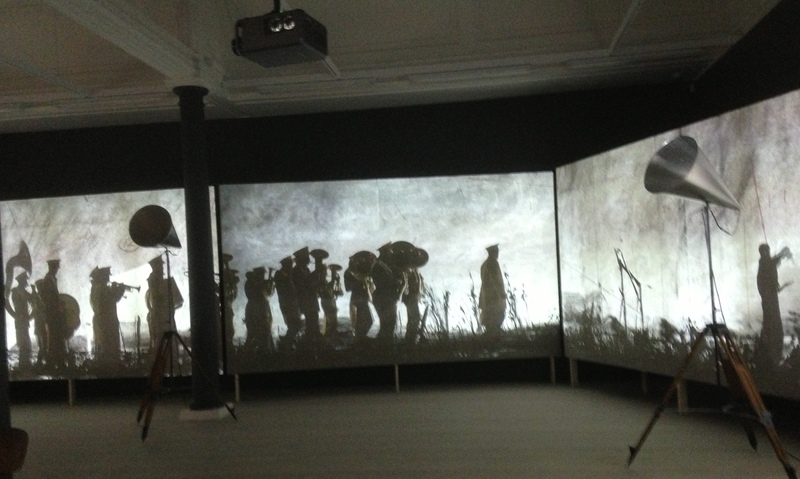 A kind of preparation for this has taken place in the rooms on the first floor, containing Kentridge’s striking works in ink on paper — some of it torn from Chinese newspapers, or facsimiles of the broadsheets published by the short-lived Paris Commune in 1871 — and by a smaller but wilder three-screen film made up of images reflecting the Commune, the Cultural Revolution and the anti-apartheid struggle. More Sweetly Play the Dance combines visual echoes of the Long March, the toyi-toyi dances originated by Zimbabwean freedom fighters and later used in anti-apartheid uprisings, the funeral processions of New Orleans, the netherworld of Mexico’s Day of the Dead, and John Singer Sargent’s famous painting of gassed and blinded soldiers being led through the craters of the Western Front. And refugees, of course: refugees of all times and places, including our own. The figures — limping, cavorting, striding — are accompanied by the sound of a brass band playing the sort of hymn tune familiar from the repertoires of Abdullah Ibrahim and Chris McGregor’s Blue Notes: a melody carried to Africa by Methodist missionaries in the 19th century, subsequently bent and enriched by the phrasing and intonation of musicians brought up in the Zulu and Xhosa cultures. The music is the work of Philip Miller, a South African composer who has worked on several of Kentridge’s earlier projects. For this one he takes the universal sound of the town brass band and adds a semi-synchronised overlay of calliope and accordion, as though all the sounds of a Saturday night in the pre-electronic age are being heard at once. Charles Ives would have loved it. So did I. It does what art is supposed to do: combining the familiar and the strange, stirring the emotions, collapsing time, going beyond words. It’s one of the highlights of the year. * William Kentridge: More Sweetly Play the Dance is at the Marian Goodman Gallery, 5-8 Lower John Street, London W1F 9DY, until October 24. I’m also thinking of Charles Ives’ “Three Places In New England” and his musical evocation of St. Gaudens’ sculpture of ‘The Black Regiment” in Boston Gardens. I finally got to see this today, and thought it was wonderful. But isn’t the ‘sort of hymn tune’ used in More Sweetly Play the Dance in fact The Internationale? I managed to catch this exhibition on Saturday, the final day, and am so pleased to have experienced it. Thank you for the recommendation Richard. Reference the music, I kept catching elements of the South Africa national anthem, Nkosi Sikelel’ iAfrika.